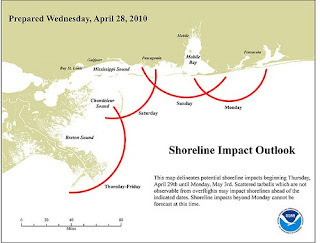 I have been closely monitoring the oil spill situation out in the gulf and I just wanted to share with my readers this projection(By NOAA) of the oil slick as it might affect the coastline. I shot several videos of my unit, the beach, and the amenities and those are available over on the left side under Destin Pelican Beach Resort Videos(5). In my last post I advertised my unit# 1004(Destin Pelican Beach Resort) at a 50% discount for 5 nights next week. The normal rate is $167 per night. With the 50% discount the price before fees and taxes is $83.50. The management company at the Resorts of Pelican Beach charge an administration fee of $50. Add that to the total then add Florida tax and the final cost to you for those 5 nights is only $518.93. This special only applies to checking in May 2 for 5 nights and check-out on May 7th. Please contact me to take advantage of this 5 night Pelican Beach spec11%ial. In an earlier post I discussed the Pelican Beach Resort wrapping up the exterior painting by painting each landing on the front of the building. Floor 10 is scheduled to be painted on May 1st which is on Saturday. Floor 10 will be completely closed that day. Most people arrive on Saturday so this has potentially knocked me out of a rental next week. Therefore, if you are willing to arrive on Sunday afternoon May 2nd and stay for 5 nights(booked again beginning May 7th), I will discount the Pelican Beach management published rates by half. What better way is there to vacation in Destin and stay in a first class condo on the beach at a 50% discount? This deal should be gone in the next couple of days. Contact me direct to take advantage of this fantastic special! I just got off the phone with Mark and he told me he just got in from vacation. I mentioned Mark and his wife in an earlier post. Mark told me he has not been to the beach for 20 years and this was one of the most relaxing vacations he has taken in a long time. He asked me if others in his office had contacted me yet as he told them about Destin and the Pelican Beach Resort. Before Mark left home he told his wife Angie not to schedule a lot of activities for them on this vacation as he intended to rest. He told me the best part of the vacation was sitting out on the balcony drinking coffee and watching the waves hit the beach. When it was time for a nap, Mark would go inside the condo and lay on the couch and let the sound of the waves put him to sleep. I asked Mark about their meals and he admitted that they picked up groceries and cooked their breakfast and lunch in the condo. For evening meals they visited several places others had mentioned to them. Floyd's Seafood one night, Dewey Destin Seafood, Olive Garden and Long Horn Steak House were all the places where they visited. Another favorite part of their vacation was shopping at "The Commons" and while there going to the movies. Mark is already planning his vacation for next year and he assured me it would be at the Resorts of Pelican Beach in Destin! I just looked at my Destin Pelican Beach Resort unit #1004 calendar and noticed that I have open May 1-May 6. However, if it doesn't rain out the landing painting on May 1st, landing #10 will be closed on May 1st. Right now the management team at the Pelican Beach Resort is offer a 15% discount for 3-4 day bookings and 20% discount for 5-6 day bookings in April and May(if booked by May 15). 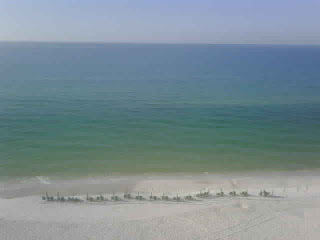 I am offering a Destin VRBO discount of 30% for my unit 1004 for check-in May 2nd and check out on May 7th(5 nights). You must contact me to set up this reservation and the discount is off the published daily Pelican Beach Resort rates. I have a fellow Realtor and friend here in Dyersburg who came in my office 2 days ago and told me he was headed to Destin for vacation. He said he had no idea where he would stay so we pulled up the calendar for my Destin Pelican Beach Resort condo and it was booked as were several others. This is when he started to get worried because he saw how beautiful the resort was from all the pictures and it was beginning to appear that they could not get a reservation due to all the bookings. However we finally were able to get him booked in a deluxe plus at a great rate. Mark contacted me last night to thank me for steering him to the Destin Pelican Beach Resort. He said the place is just beautiful and the balconies directly on the beach looking out over the Gulf of Mexico just takes your breath away. After Mark thanked me I told him not to miss the great shopping at Destin Commons which is only 5-6 miles east of the resort. I also told him to take his wife to dinner at the Back Porch Restaurant(2-3 miles east) and today take his wife to eat at Callahan's Restaurant(2 miles west). This is where my Realtor took me for lunch the first time and also where many of the locals dine. Mark, if you read this post I hope you will tell all our readers(by commenting) what you think about the Resorts of Pelican Beach! Yesterday Joan Neese told me the painting of the landings was going well and on schedule. Also, I had a friend yesterday who called the Destin Pelican Beach Resort to make a reservation but he was moved to a different condo than I referred him to(mine was booked so referred him to another unit). I had forgotten that the floor I referred him to was being painted today. Actually it worked out in his favor because he was given even a lower price because of the inconvenience. If you are considering a vacation to Destin Florida in the next few months let me suggest you book your reservation early as most deluxe plus units are filling up fast. I had a friend this morning in McDonalds pull up my calendar and could not find the dates open he needed. My banker(who financed my condo) told me yesterday that the dates for his family vacation(June 9th-13th) did not match my open dates for the rental of my 1 bedroom Pelican Beach Resort beach condo. Also remember that there are discounts available for early bookings(by May 15). The H.O.G. Rally is coming to Destin this October. You are thinking that the Destin Pelican Beach Resort is not pet friendly so what's the deal with the HOGS? H.O.G stands for Harley Owners Group and they come to Destin every year for a rally. The rally begins October 20th and runs through the 23rd. The Resorts of Pelican Beach in Destin is offering special discounts for anyone attending this rally. Just click on this link for the rates and more information. Click here to go to the website for the H.O.G Rally. I just had a cancellation for the week beginning today through April 23. If you are interested in renting my Destin Pelican Beach Resort 1 bedroom unit at a 30% discount then this is your chance(if you contact me directly). This special price is just for these dates only. Hurry to grab this deal as I don't expect it to be available very long at this great discounted rate. Update: one hour later and these dates are now taken! Today the Pelican Beach Resort Destin Management Company posted early booking specials for late spring to mid summer. 15% off daily rates on a three or four night stay, or 20% off daily rates on a five or six night stay, or 15% off weekly rates from now to May 27,2010 when booked by May 15, 2010. 20% off daily rates on a four to six-night stay or 15% off weekly rates from May 28, 2010 to July 1, 2010 and July 7, 2010 to July 29, 2010 when booked by May 15, 2010. In addition, let me remind my readers that I add on an additional 5% discount if you allow me to book my unit for you. In a later post I will run these numbers for you for 3,4,5,6 and 7 night stays at the Destin Pelican Beach Resort. The outside painting at the Destin Pelican Beach Resort has been completed. However, the fun is now beginning. Actually what I am talking about is the painting of the walk ways on each floor(in front of the front condo doors). Joan Neese(With the Pelican Beach Resort homeowners association) has sent each Pelican Beach Resort Condo owner(Pelican Building on the beach) a copy of the schedule for this walkway painting. In the event of a rain day the floors that would have been painted on that day will be pushed until the end of the project instead of disrupting the rest of the schedule. This schedule indicates the dates each floor will be closed for painting. If the floor where you are scheduled to be is indeed closed, the Pelican Beach Resort staff will move those renters to another floor temporarily until the paint is dry. Joan told me that since my floor(10th) is projected to be closed(unless it is rainy that day)May 1st, my renter can check in at 4pm on May 2nd. Actually my calendar is open for May 1st so my renter will not have to be relocated temporarily. I appreciate all the support my readers are giving me and I also appreciate all the renters of my Pelican Beach Resort condo on the beach. Did you know that the management team at the Pelican Beach Resort in Destin compiled a list of outside Pelican Beach Resort activities available to the vacationers in Destin? While in Destin,Florida and staying at the Pelican Beach Resort last week I observed lots of different license plates on cars at the resort and I also talked to several families on the beach and even at church. Here are the states represented there on vacation. 9. Texas-This was the surprise to me. I talked to a family on the beach and they were also staying next door in unit 1005. They were from Houston and it took them 9 hours to drive to Destin. I asked them why they don't go to San Padre Island and they said it was much prettier in Destin(sand and water). I talked to a family in church there and they were from Humboldt,Tennessee. They told me they were staying in unit #1004 and I told them that was impossible since I owned and was staying in unit 1004(mine is on the rental program but not that week). I asked him to show me his rental and he took me to the "Terrace" building there at the Pelican Beach Resort. My unit is in the Pelican Building on the water. His unit was a 3 bedroom and very nice but not on the water.I believe this family is going home today. A few days ago I shot a new video off my balcony #1004 at the Pelican Beach Resort Destin. We spent our Easter vacation there and the weather was just beautiful. This is probable the busiest week of the year for the Pelican Beach Resort and as you can see on the beach it was pretty crowded. While on our last trip to Destin Pelican Beach Resort my family and I ate at one of our favorite Destin restaurants that is on the beach. Here is a video that I shot of the restaurant. 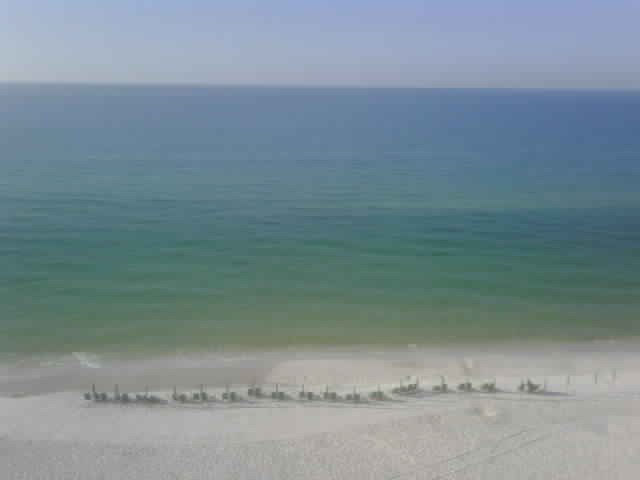 I just checked my calendar and April 10-14 for Destin Pelican Beach Resort unit #1004 is still available. These 5 nights are being offered at a 30% discount if booked in advance. Actually these are the only dates not already booked in April. My family and I have been here in Destin since Thursday and are leaving tomorrow. Another renter is checking in behind us. We have had a great time but must get back to work and school. There has been lots of activities available to us but our favorite has been swimming and playing on the beach. If you are looking for a Destin beachfront rental during the above dates please let me know and I will assist you with getting booked at the Pelican Beach Resort Destin. I shot some video during this vacation and will share them here when I get them edited and published. Today on the beach there were so many people playing and basking in the sun behind the Pelican Beach Resort. The parking areas are full and still people are checking in tonight in the main lobby. I had a friend who wanted to book my unit earlier and the front desk asked us to wait a while as they were swamped with arrivals. I did not count but believe I had about a dozen families contact me through my VRBO account wanting to rent my condo this week during good Friday and Easter break. The weather is great and not too hot and my family is having a great vacation. The Destin Pelican Beach Resort is the "perfect family vacation destination". Sometime Monday afternoon there should be a different notice posted in all the elevators for youth activites on Tuesday April 6,2010 at Destin Pelican Beach Resort. In other posts I have discussed why the Pelican Beach Resort Destin is a "kid friendly" and great family resort. There are four other reasons I want to mention for bringing your family to Destin to our resort. 1. When you check-in the front desk staff place a plastic(hospital style) wrist band on every child(under 25). They also ask that each vehicle have a Pelican car tag hanging on rear view mirror. If a car is on property without proper identification or a young person on property without property identification then security takes care of the problem. 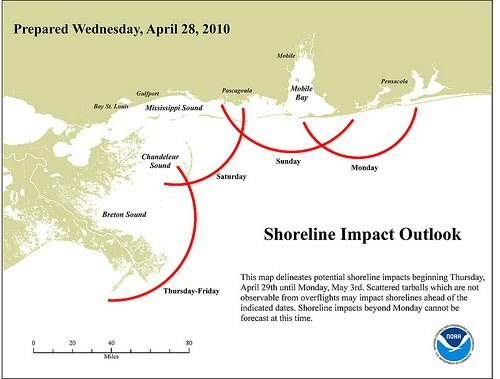 This would also keep non renters off the beach behind the Pelican Beach Resort. 2. During spring break and major holidays during peak season a sheriff's deputy(hired on his or her off duty day) has their squad car parked just outside the lobby area. The uniformed officer is also present. This begins around 5pm until late night. 3. There is a Pelican Beach Resort security officer and small security building at the entrance to the resort. 4. Regular kids programs start up memorial day but during spring break there are special activities planned each week day for the kids. I saw a new posting in all the elevators for activities on Monday April 5,2010 and will post about those activities later. Yesterday when we arrived at the Pelican Beach Resort Destin I got on the elevator and saw a posting for tomorrow's youth activities. After we did all our shopping earlier we headed to the beach. My family is out there now eating a picnic lunch and enjoying the sun and the surf. I have to get back out there to join them! This morning I woke up to this view off my balcony at the Destin Pelican Beach Resort. We arrived about 9:30 last night and this resort is already packed. It was almost like homecoming when we walked in and saw Ashley and staff at the front desk welcoming us back. The weather is forecast sunny and in the 70's.If you are looking for a great family friendly destination on the beach then it does not get any better than Destin's Pelican Beach Resort. The original deadline for early booking discounts(Destin Pelican Beach Resort) for spring and summer was March 15, 2010. That was extended to March 31 and now has been extended to April 15,2010. These discounts range from 15%-20% and during one week period in April(9-16) the discount is 30%. That early booking deadline was only extended to April 10th.